The conference will take place on campus of the Czech University of Life Sciences in Prague. It is located in a quiet neighborhood called Suchdol on the nothern edge of Prague, near one of the nicer forest parks and the steep walls of the Vltava valley (with superb views!). Getting to Suchdol is fairly easy. For driving instrutions, find your way on google maps, the address is "Kamycka 129, Praha". By public transportation, take metro to the "Dejvická" station on the A line (cca 20 minutes from both the airport and the railway station), follow the signs towards the bus terminal for Suchdol, and take one of the buses 107 or 147 to the "Zemedelska univerzita" stop. The ride takes about 10 minutes. The buses operate frequently from early morning till past midnight, the last bus waits for the last metro. There is a night connection by bus 502. You can always find your connection online. Tickets are sold in vending machines and in newstands at all metro stations and at the airport (and elsewhere). The two basic variants are 30 minutes for 24 CZK and 90 minutes for 32 CZK. Taxis are better called over the phone, some of the more reliable companies are for instance AAA Taxi or TickTack. Here is a campus map. 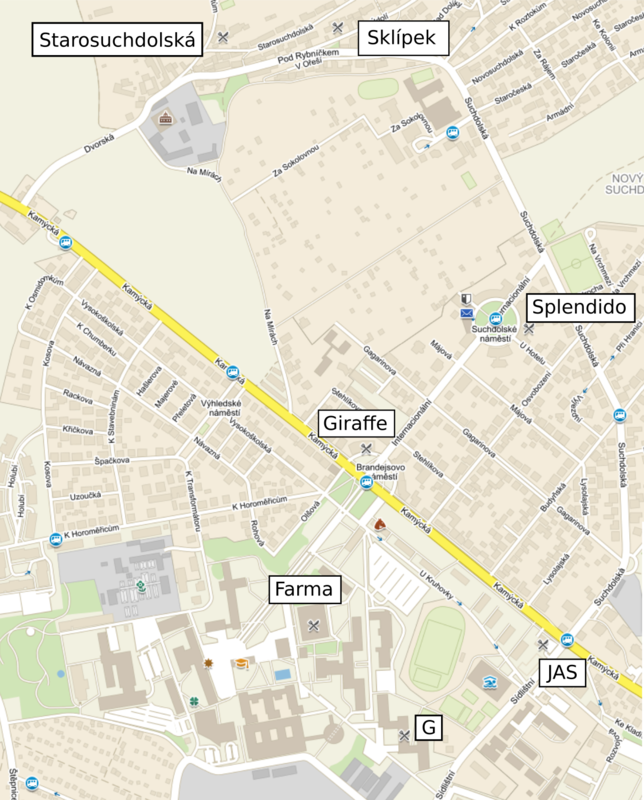 Here is a larger map with nearby restaurants and here is a brief information about what they offer. We offer an option to stay in the university dormitory located on campus. Luxury it isn't, but it is clean and conveniently located to the conference site. (Unfortunately, there is no breakfast in the dorms.) Please mark your interest in the registration form. The number of rooms is limited and will be distributed on the first come first served basis, hence, if interested, we recommend to register as soon as possible. 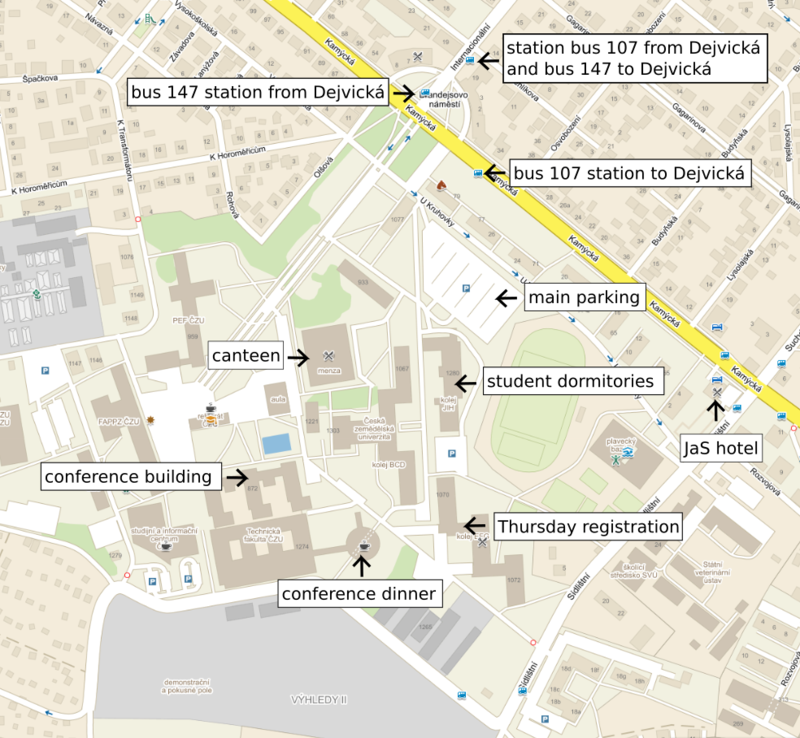 Another convenient option is anything in Dejvice, the closer to the "Dejvicka" station the better. The nearest big international hotel is Hotel International (yes, this is the Stalinist monumental building!). As anywhere else, all these places can be booked through booking.com. Note that citizens of some countries need visa to enter Czech Republic. To learn more in this respect, please visit the official website of the Ministry of Interior, and double-check with your local Czech consulate. We may send an invitation letter upon request to participants provably working in algebra or a related field. If you need one, let us now well in advance by email (not just in the registration form), as processing takes an unpredictable amount of time. Czech Republic is a part of the Schengen group, hence, any Schengen visa shall allow you to enter Czech Republic (again, double-check with your consulate).